(Nanowerk News) What do some high-end golf clubs and your living room window have in common? The answer is glass, but in the golf clubs' case it's a specialized glass product, called metallic glass, with the ability to be bent considerably and spring back into its original form. Your windows, as you know, aren't quite as forgiving of a sudden impact, and they shatter – they are brittle, as opposed to ductile, or more flexible products. For the golf clubs, however, a new generation of flexible metallic glass puts more bounce back into a golf ball, from the metallic glass' high elasticity. They're not unbreakable, but close. And scientists are working toward even stronger and more elastic glass types which would fail in a ductile fashion instead of shattering. 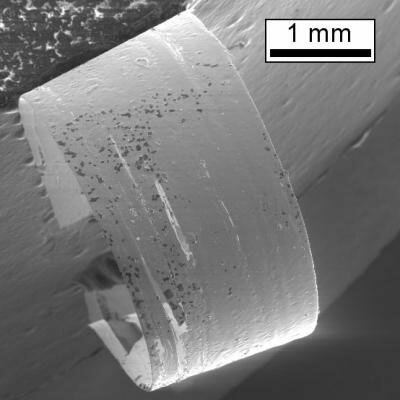 This image shows a piece of metallic glass that has been bent around onto itself with a 1mm radius and glued into place. It would spring back to a flat piece if the glue were removed. "In glass, localized plastic deformation usually leads to immediate failure," said Seth Imhoff, a Los Alamos National Laboratory materials scientist. "Normally, metal alloys freeze into a collection of crystals in which the atoms line up into very specific patterns. In specially designed metal alloys an amorphous, or random atom arrangement, can be retained in the solid, which can allow us to tailor a wide range of properties such as the ability to be bent severely and spring back into place."